When it comes to planning events such as weddings or banquets, we have you covered. From facilities to catering to impeccable service, Whitney Oaks offers the perfect venue to make any occasion one to cherish. Together, our clubhouse’s two banquet rooms can comfortably seat up to 200 guests, along with a fully stocked bar and lounge. An expansive terrace with seating overlooks our outdoor event space near the foot of the 18th green. Entire Clubhouse: Monday - Thursday | $1,900 Friday & Sunday | $2,400 Saturday | $2,900 Entire Clubhouse Rental Includes: • Access to Bridal Suite 2 hours prior to ceremony • Fully private facility with Private Bar and Bartender • Set-Up, Tear-Down, Tables, Chairs, Standard Linens, China, Flatware, Glassware, Service Staff, Cutting, Plating and Boxing of Wedding Cake • Complimentary Tasting for up to Four Guests Monument Banquet Room: Monday - Thursday | $1,200 Friday & Sunday | $1,500 Saturday | $1,900 Monument Banquet Room Rental Includes: • Access to Bridal Suite 2 hours prior to ceremony • Set-Up, Tear-Down, Tables, Chairs, Standard Linens, China, Flatware, Glassware, Service Staff, Cutting, Plating and Boxing of Wedding Cake • Complimentary Tasting for up to Four Guests. 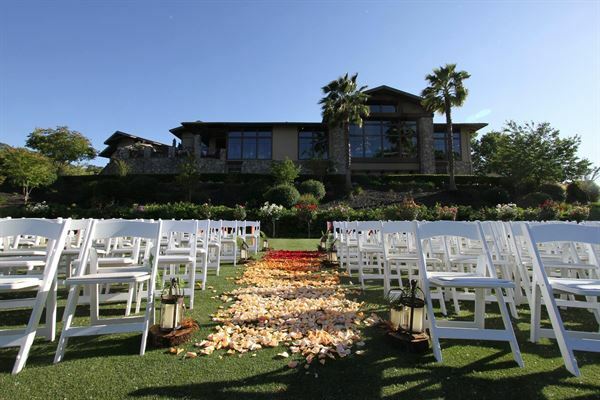 Garden Ceremony: Any Day | $1,500 Oak Tree Ceremony Any Day | $2,200 Garden Ceremony & Oak Tree Ceremony Includes: White Chairs, White Wedding Arch, Set-Up and Breakdown. Please see attachment for additional information and menu options.